Go vegan, even for a moment! Vegan Rob's goals are simple - love yourself, our planet and all living things. Snack as clean and kind as possible. 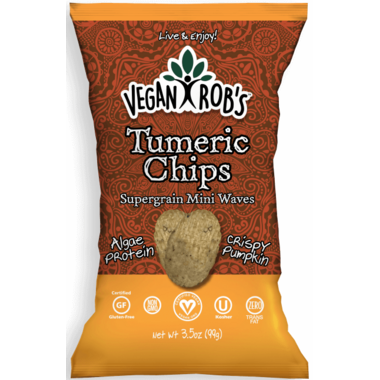 You don't have to be vegan to enjoy Vegan Rob's plant based snacks! Created from ingredients of this green earth, they are addicting; with a taste that's out of this world! Ingredients: Base (Sprouted Brown Rice Flour, White Rice Flour, Flax Seeds, Chia Seeds, Quinoa, Salt), Topical Seasoning (Nutritional Yeast, Pumpkin Powder, Sea Salt, Evaporated Cane Juice, Turmeric (color and flavor), Brown Sugar, Onion Powder, Whole Algal Flour, Spices, Nautral Flavor) and Sunflower Oil. Vegan Rob's is manufactured in the same facility as: Sesame, Milk, Eggs, Wheat, Mustard. 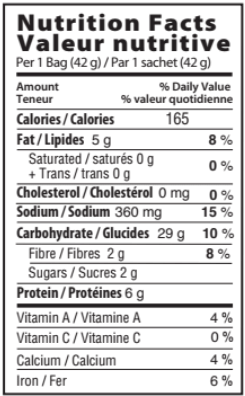 Vegan Rob's has a dedicated line separate from these ingredients.